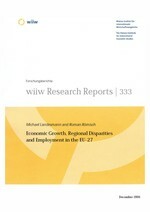 The present study examines the economic development of the NUTS-2 level regions in the EU-27 from 1995 to 2003. It focuses on income and employment developments in the regions of the new EU Member States (NMS) and compares the results to the developments in the regions of Northern as well as Southern EU countries. As far as income developments are concerned the study concentrates on the convergence of regional incomes and the effects on the spatial distribution of the income per head, especially with regards to existing or evolving core-periphery patterns, as well as on the development of regional income disparities within the EU-27 as a whole, but also within individual countries and country groups. As far as employment is concerned the study analyses firstly general employment trends in the EU-27 regions, as well as regional employment trends by economic sectors of activity, by educational attainment levels as well as by the age structure of the labour force. Innovatively, in main parts of the study the EU-27 NUTS-2 regions are grouped in eight clusters according to their pattern of secotral specialization, whereby the eight groups of regions that are defined in the study are: agricultural regions, mining industry regions, basic industry regions, forward-looking industries regions, basic services regions, tourism regions, business services regions, and capital city regions. The results in the study clearly show that economic prosperity differs widely across these eight group of regions (especially in the NMS), whereby economic prospects in the agricultural regions and partly also in the basic industry regions are relatively bleak, given those regions’ peripheral location as well as their low attractiveness for domestic and foreign investors. This is contrasted by income growth and good employment prospects in the capital city regions and in the regions that are specialized in modern industries.